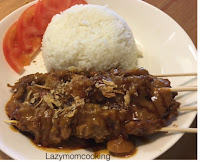 After Beef Satay ( http://www.lazymomcooking.com/2016/06/beef-satay.html ), what I want is Chicken Satay! Since young, I also always love chicken satay! Same like Beef Satay! I cannot find a good chicken satay around here! That make me want to try to make it! The result, I got positive feedback from some people who I share this chicken satay to, including my husband of course! I still don't have any courage to try to make 'Lontong' (rice that cooked in banana leaf). Hopefully one day I will have that courage! So there is no lontong! But it is not a reason to not eating satay! We still can use the normal steam rice, of course! And here is the Chicken Satay! Boiled water and cook chicken until it is cook and tender. Heat the pan, add cooking oil, saute the meats that has been marinated. Cook until it a bit dry and oily and also all mix well. Pin meats on the skewers or you might want to leave it without skewers. It is not that difficult! Simple yet tasty! Try it and serve it with rice! You might want to add fried shallot on the top of the peanut sauce!